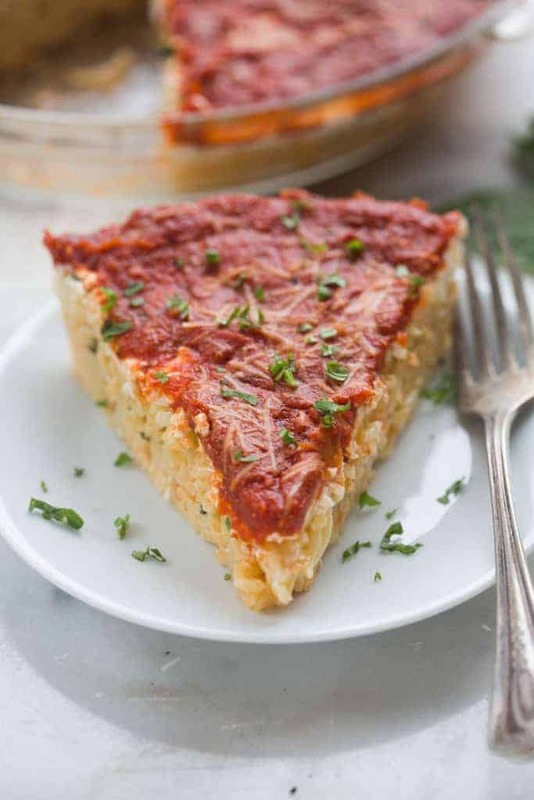 This baked spaghetti pie recipe is easy enough for a busy weeknight meal and sure to be loved by the entire family. It’s also a great take-and-bake meal for a family or friend in need. 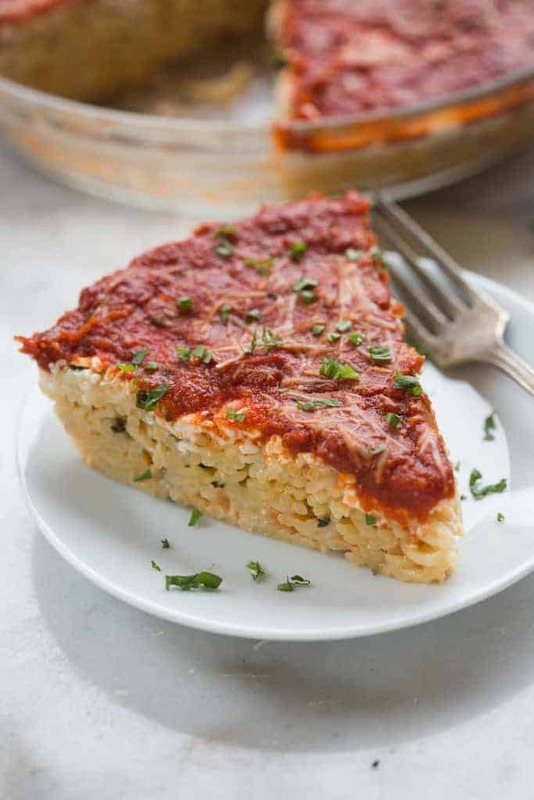 My family never grows tired of this spaghetti pie. Think classic spaghetti, reinvented into a family-pleasing baked casserole. Full credit for this family-pleasing dish goes to my mom. She made this all the time. It’s still one of her go-to meals whenever she is bringing a family dinner because you can count on the entire family to love it, no matter their age. To make spaghetti pie you start with hot cooked spaghetti noodles, tossed with butter, fresh parmesan cheese, basil and a beaten egg. The egg and parmesan cheese help the noodles to hold their shape when you cut the dish into fun, pie shaped slices. The noodles are then layered with cottage cheese. You could substitute ricotta if you like. Then smother everything in spaghetti sauce. You can make a delicious homemade spaghetti sauce (my husband always likes a yummy meat sauce), or you can use your favorite store-bought jar of spaghetti sauce. You’ll need about 1 1/2 cups of sauce. That’s it! I usually sprinkle the top of the sauce with a little extra parmesan cheese. If you like lots of cheese, you could even add a handful of mozzarella cheese on top, before you bake it. I love how bubbly, warm and delicious it gets when it bakes. Allow it to cool for a few minutes and then slice it like you would a pie. I love the way the noodles hold the pie shape as the peices are served. It’s easier to eat than regular spaghetti, and my kids love it this way. Serve spaghetti pie with a side salad, a steamed vegetable, some toasted garlic bread, or my favorite breadsticks. Make the pie completely, but don’t bake it. Cover tightly with plastic wrap and refrigerate for several hours, until ready to bake. If you want to prepare it more than 1 day in advance, I would suggest not adding the pasta sauce until right before you bake it (otherwise liquid from the sauce may pool at the bottom of the pan while it sits in the fridge for so long). Cook the noodles just barely until al dente (don’t overcook). Prepare the pie through step four (don’t bake it yet). Allow it to cool completely, then cover well with tin foil and freeze. When you’re ready to bake it, remove it from the freezer and bake from frozen, covered, for about an hour and 15 minutes. Then uncover it and bake until heated through (another 30 minutes or so). I like to serve it with extra sauce, since the sauce gets soaked up more in the noodles this way. A delicious baked spaghetti dinner with a layer of parmesan cheese and basil noodles, topped with cottage cheese and spaghetti sauce. Lightly grease a deep 9'' or 10'' pie plate with cooking spray. Cook spaghetti noodles according to package directions. Drain, and add hot noodles to a large bowl. In a small bowl, beat the egg. Add the butter and the hot pasta. Toss until butter is melted. 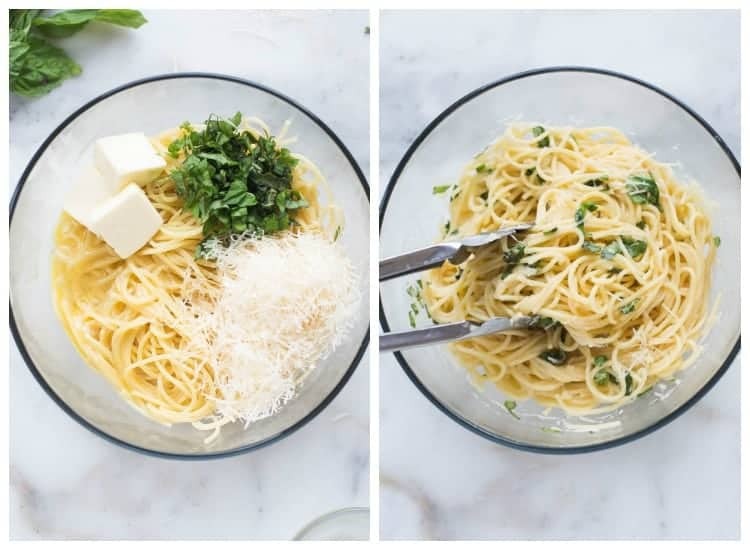 Add parmesan cheese, basil, and a little salt and pepper and toss everything gently to combine. Empty pasta mixture into prepared pie pan and pat down tight. 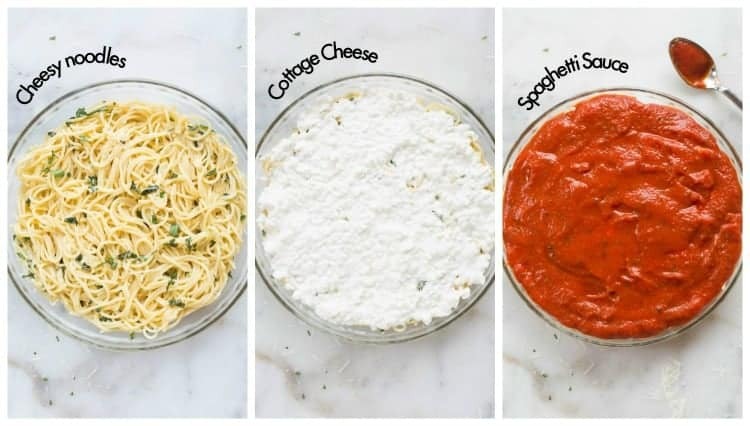 Spread cottage cheese evenly over the top of the pasta. Spoon your favorite spaghetti sauce over top and smooth into an even layer. Allow to cool for 5-10 minutes before slicing into wedges and serving. *You can substitute ricotta cheese for the cottage cheese. *This recipe fits a deep dish pie pan. 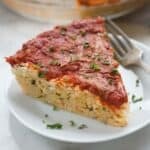 If you don't have a deep dish pie pan than I would suggest making this in an 8x8'' square (or similar size) casserole dish. Make ahead and freezer instructions are listed above in the post! This is a winner!! My kids loved it 🙂 definitely going in the rotation at our house! One of my fav quick, easy and delish!! Delish! For my fam I doubled the recipe. I also added a layer of meat before the sauce & covered the top in a mixture of grated & shredded parm. Doubled, it fit perfect in a 9×13 & only needed a few extra minutes baking time. So good & easy! My guys loved it! Major props to your mom! Thanks for sharing her recipe! 5 stars! Egg Allergy – What could you use to replace the egg as a binder? Here is a resource that lists some egg-binding substitutes! Can you use cream cheese instead of cottage cheese? Sure. The taste and texture will just be different.